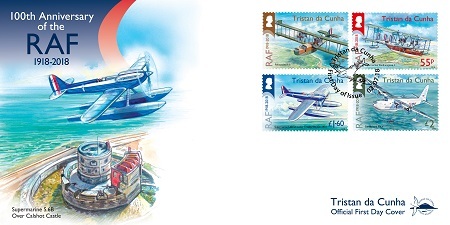 Stamps commemorating the centenary of the formation of the Royal Air Force. On 10 October 1961, the eruption of a volcano adjacent to the settlement on Tristan forced the entire population of (then) 290 persons (264 islanders & 26 expats) to evacuate the island, taking to sea in two fishing boats to the uninhabited Nightingale Island. After a lengthy sea journey to Cape Town aboard Dutch Liner Tjisadade the population eventually arrived on the RMS Stirling Castle at Southampton in Britain on 3 November 1961. Initially placed in Pendell Camp in Surrey, the islanders were soon moved to better accommodation in 1930's married quarter houses at the former RAF Calshot flying boat base in Hampshire. They arrived there on 23rd January 1962, and lived there until November 1963 when most had returned to Tristan, having endured 'flu epidemics over one of the worst winters of the 20th Century 1962-1963. The road of married quarters, now private dwellings, is still named 'Tristan Close' in memory of the islander's stay. Tristan's small harbour built after the islanders' return is named 'Calshot Harbour'. 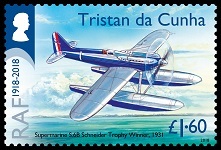 In celebration of the Royal Air Force's centenary in 2018, Tristan da Cunha has decided to remember the period the islanders spent at RAF Calshot by commissioning a set of stamps portraying a variety of aircraft based at RAF Calshot over the years. Calshot was originally established as a flying station in 1913 by the Royal Flying Corps to test new seaplanes for the Naval Wing and was the base for Royal Naval Air Service seaplanes throughout the Great War. Officially renamed Royal Air Force Calshot in 1922, the interwar period saw Calshot at the forefront of marine aircraft development in addition to regular flying boat squadrons based at the station. 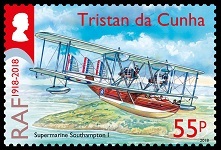 1924 saw an attempt by an RAF crew to fly a seaplane from Calshot on a planned round-the-world flight that sadly ended after 13,000 miles in the Bering Sea and indeed the famous High Speed Flight comprising seaplanes developed to win the Schneider Trophy was based there from 1927 – 1931. The Second World War saw Calshot lose the regular flying boat squadrons to other bases, but it took on other vital roles, becoming the main base for the repair, modernisation and maintenance of the RAF's flying boats, particularly the large Short Sunderland, hosting Air Sea Rescue units and the training of the RAF's marine boat crews. Post war, operational flying boat squadrons quickly returned to Calshot, with two Sunderland squadrons based from April 1946. The Berlin Airlift crisis saw all Calshot's aircraft in use during the period of the 'Luftbrukke' (air bridge), flying from Finkenwerder, Hamburg to Lake Havel, Berlin. The two squadrons left for the Far East in 1949, having flown a total of well over 1,000 sorties, transporting 4,500 tons of heavy stores, particularly coal and salt, into the city and evacuating sick civilians, especially 1,113 starving children. By the early 1950's, Calshot was primarily a marine craft station, responsible for the servicing of all RAF marine craft, target towing and Air Sea Rescue fast launches. The long and illustrious flying boat tradition at Calshot finally came to an end in the early 1950's when two of the three giant Princess flying boats which would have been used for the transporting of 100 passengers over a 5,000-mile range were declared obsolete, having never flown and were cocooned and stored at Calshot prior to their eventual scrapping. Royal Air Force Calshot finally closed on 1 April 1961, after a continuous military service of 48 years. The three main hangars built and used over that period are still standing and are in use in a variety of guises. Felixstowe F.5 flying boats were developed from the earlier F.3 and F.4 models, based on an American Curtiss design, but with re-designed hulls by Cdr John Porte. Powered by two Rolls-Royce Eagle engines, these excellent long range aircraft had an endurance of seven hours, maximum speed of 88 mph, and could carry up to 920lb of bombs. At least ten of Calshot's complement of F.5's were locally built by the Gosport Aircraft Company. These aircraft entered the then new Royal Air Force right at the end of the First World War and were flown by 230 Sqn at the newly named RAF Calshot in 1922. Designed and built locally by Supermarine of Southampton, the wooden hulled Southampton 1 replaced the F5 in 1925 with 480 (Reconnaissance Flight) at Calshot. Powered by two Napier Lion engines, the Southampton 1 had an endurance of over six hours, could carry 1100lbs of bombs and a maximum speed of 95mph. Four Southampton 1's of the Far East Flight made a journey of over 27,000 miles from Felixstowe via Calshot in 1927-8 to Australia, mapping the entire coastline of that country in the process and only had to replace one propeller and one engine! This proved the viability of long-range air travel, both for civil and military routes. The Schneider Trophy was a competition devised in 1913 by an armaments manufacturer – Jacques Schneider – to improve marine aircraft, with competing aircraft designed and built to be the fastest aircraft in existence. By the mid-1920's, the competition had become a major source of national pride for competing nations, especially Italy, France, Britain and the USA. Supermarine of Southampton were one of several British manufacturers to compete, but their brilliant young designer, R J Mitchell (of later Spitfire fame), developed an all metal aircraft, the S.5, in 1927 to win that year's trophy. He re-engined the aircraft design as the S.6 in 1929 to include the new V12 Rolls Royce engine and won the 1929 contest (one of the 1929 aircraft may be seen in Solent Sky Museum, Southampton). For the 1931 contest, to ensure that Britain won the Trophy outright and in perpetuity, Mitchell re-designed the floats, Rolls 'tweaked' the engine to produce the S.6B, and on 13 September 1931, Flt Lt John Boothman won the race at a speed of 357 mph in S.6B S1595, as depicted on the stamp. Two days later, Flt Lt George Stainforth raised the world speed record in the sister aircraft, S1596, to 407 mph. 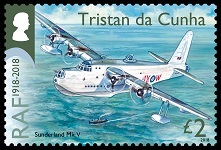 The Short Sunderland Mk V was the final operational variant of this fine aircraft. The Mark V had an endurance of 13.5 hours (or 20 hours with overload fuel tanks) at the cruising speed of 180mph, with a crew of between 7-11, a variety of defensive armament and a useful bomb load. 230 Sqn, who had introduced the Sunderland to the RAF in 1938, returned to Calshot along with 201 Sqn in 1946, and the two squadrons were detached in 1948 to fly the aircraft in the Berlin Airlift transporting salt and coal from near Hamburg until February 1949, when both squadrons were redeployed to the Far East, thus ending Calshot's flying boat operations. 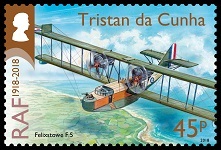 The aircraft depicted on the stamp is in the post-war 230 Sqn markings. Solent Sky Museum has a civilian Sunderland V conversion – a Sandringham IV – on display in the museum.